Powerful ADMET Property Estimation, at your fingertips! As a drug or agrochemical discovery scientist, your task is to create high quality lead compounds. As toxicologist in the pharmaceutical, chemicals, food, and cosmetic industries your task is to make sure that your products are safe for humans and the environment. The ADMET (absorption, distribution, metabolism, excretion, and toxicity) properties of your molecules are of vital importance. The ability to quickly and accurately predict these properties simply from the 2D structure of the molecule is extremely helpful in making decisions that can determine the success of your project. ADMET Predictor is state of the art ADMET property prediction software. 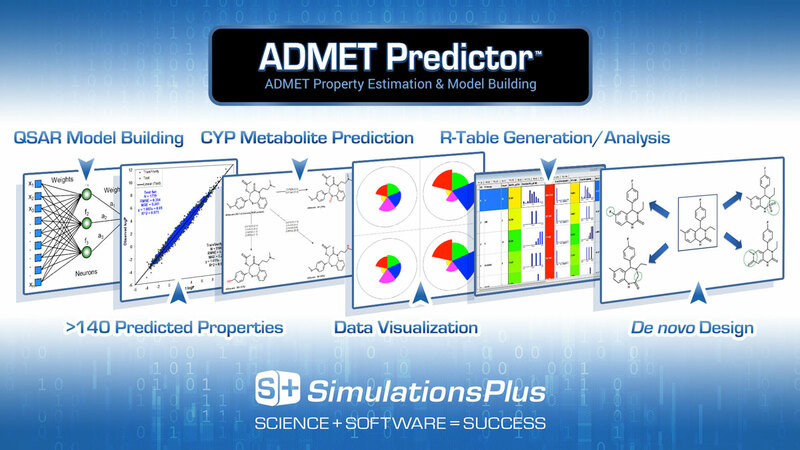 ADMET Predictor is a software tool that quickly and accurately predicts over 140 properties including solubility, logP, pKa, sites of CYP metabolism, and Ames mutagenicity. The ADMET Modeler™ module in ADMET Predictor allows one to rapidly and easily create high quality QSAR/QSPR models based on your own data. The newest module offers advanced data mining, clustering, and matched molecular pair analysis. The program has an intuitive user interface that allows one to easily manipulate and visualize data. Each module can be purchased individually. What are we providing with ADMET Predictor (AP)? How is AP being applied? Most commercial drugs suitable for oral dosing violate no more than one of the rules these conditions represent. As an extension of that concept, Simulations Plus has created a series of “ADMET Risk” rule sets and calibrated them against our own ADMET models. They are parameterized to include thresholds for a wide range of calculated and predicted properties that represent potential obstacles to a compound being successfully developed as an orally bioavailable drug. These thresholds were obtained by focusing in on a specific subset of drugs in the World Drug Index (WDI). Similar to the methodology used by Lipinski et al., we removed irrelevant compounds from a 2008 version of the WDI. In particular, we removed phosphates, antiseptics, insecticides, emollients, laxatives, etc., as well as any compound that did not have an associated United States Adopted Name (USAN) or International Non-proprietary Name (INN) identifier. The structure of the principal component in salts was extracted and neutralized, after which duplicate structures were removed. This left us with a data set of 2,316 molecules, 8.3% of which violated more than one of Lipinski’s rules. An illustration of “soft” thresholds for an inequality rule. 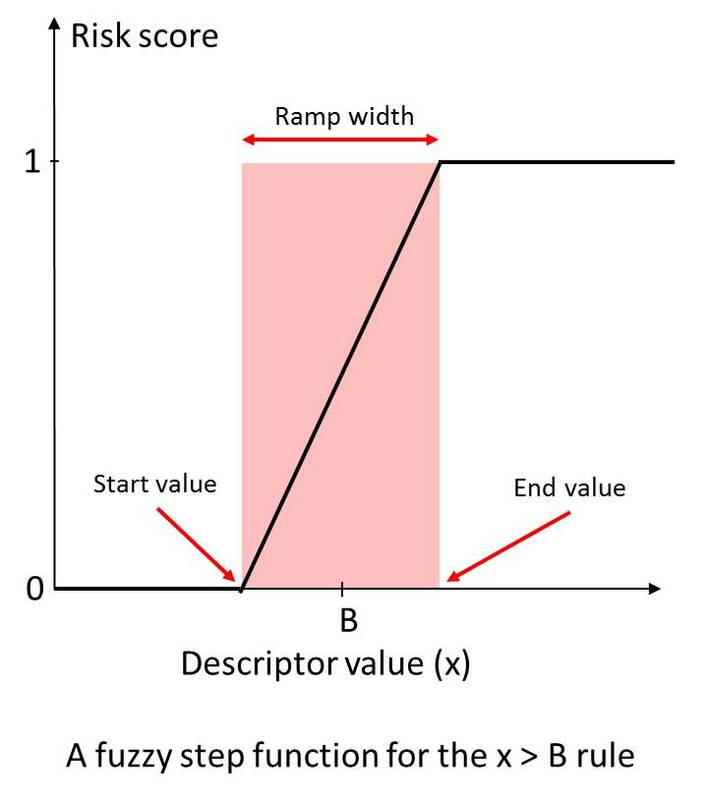 The score starts increasing linearly from 0 at “start value” of the descriptor in the neighborhood of the boundary B, and reaches 1 at the “end value” value of the descriptor. Rule of 5 only addresses a narrow slice of the full gamut of hurdles a compound must pass before it can become a drug. In addition, it relies on “hard” thresholds: a compound with a molecular weight of 499 satisfies the MWt rule but a compound with a molecular weight of 501 violates it. We calculated a broad range of relevant molecular descriptors and ADMET property predictions for the focused subset of WDI and identified “soft” threshold ranges for each along the lines suggested by (Petit; 2012) such that approximately 85% of the compounds in the data set satisfy them completely and somewhat less than 10% violate them completely. The former contribute nothing to the overall Risk, whereas the latter contribute the full amount (weight) specified for the corresponding rule. Predictions falling in the gray area in between contribute fractional amounts to the Risk Score. The concept is illustrated on the left. where the values within the brackets indicate the boundaries of threshold regions. The Sz rule includes four individual criteria, all of which use the “>” relational operator. Predictions falling below the minimum threshold values contribute nothing to the Risk, whereas predictions above the maximum contribute 1 violation “point”. Intermediate values represent intermediate risks: a compound of molecular weight 500 violates the first criterion and so would represent an incremental Risk of 0.5 points for that criterion. Logical operators such as ORs and ANDs can also be included in the rules. 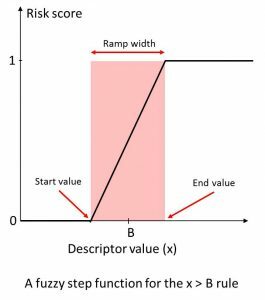 The combined points from the criteria making up a rule then yield an overall value between 0 and 1, which is multiplied by the weight assigned to the rule as a whole. Two additional pharmacokinetic risks (high plasma protein binding and high steady-state volume of distribution) are also included in the ADMET_Risk score. Lipinski CA, Lombardo F, Dominy BW, Feeney PJ. “Experimental and Computational Approaches to Estimate Solubility and Permeability in Drug Discovery and Development Settings.” Adv Drug Delivery Rev. 1997; 23:3-25. Petit J, Meurice N, Kaiser C, Maggiora G. “Softening the Rule of Five – where to draw the line?” Bioorg Med Chem. 2012; 20:5343-5351. What's new in AP v9.5? New Structure Sensitivity Analysis (SSA) – Interactive visualization of the atomic contributions to a predicted property. Our regression models (logP, solubility, etc.) are now accompanied by uncertainty estimates for each compound. New models to predict Ames mutagenicity, AOX and BCRP substrate/non-substrate, and OCT2 and BSEP inhibition. Metabolite prediction now includes aldehyde oxidase (AOX), esterase and UGT products. The Pipeline Pilot and KNIME workflows have been significantly improved and modernized. Improved models for human blood-to-plasma ratio, blood-brain barrier penetration and rat liver microsome intrinsic clearance. New lists of structure alerts for reactive metabolites and other toxicities. You can use the new SSA window to visualize how each alert hits your compound. New feature to facilitate sharing ADMET Modeler™ models across your organization. Many significant visual and functional improvements to MedChem Designer™, including pKa microstate analysis, visualization of atomic properties, prediction of fraction absorbed and bioavailable, display of logD-vs-pH and solubility-vs-pH curves and more. Join your peers around the world and begin working with ADMET Predictor to generate the insight you can’t measure to make better decisions.